Common world opinion is that India is on the threshold of becoming a global economic power and a reasonably developed country in 15 to 20 years – in the 2020s. This belief gains strength from the encouraging changes witnessed in the country since 1990 when a marked shift in policy was embarked upon by the central government and we gradually changed from ‘closed’ to ‘open’ market conditions. One may not totally agree with the way we went about this change – a bit lopsided as witnessed by the ushering in of cars before we got the roads – but it is a path we are unlikely to change irrespective of the political party at the centre. We have succeeded in a certain degree of development in the country but this has taken place only in a few pockets of the country. This is where we have gone wrong and it is easily borne out by just analysing the steel sector alone. It is an established fact that steel plays an important part in a nation’s development and per capita steel consumption is considered a good indicator of development. What, then, is the ground reality in India? Before attempting to analyse the ground reality in India it is essential to develop basic yardsticks. Generally, countries are categorised as under-developed, developing or developed. 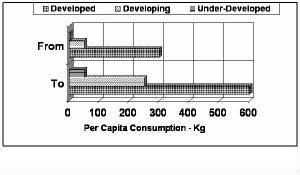 Consumption pattern of long / flat products and per capita steel consumption are good indicators of a nation’s development. In early stages of development, bulk of steel requirement is for long products for infrastructure and basic industries. Demand for flat products increases as the country gets developed and the need for white goods and consumer products rises. These are shown in Charts 1 & 2. It is generally accepted that 80 to 85 % long products are needed in under-developed countries, about 60 to 65 % in developing countries and 30 to 35% in developed countries. Further, per capita steel consumption is generally 5 to 50 kg in under-developed, 50 – 250 kg in developing and over 250 kg in developed nations. These are depicted in the two Charts. Today, a per capita steel consumption of around 500 kg is considered close to the saturation point – except for high population density small countries. While the world average is around 145 kg, the per capita consumption data on a few countries is: Singapore 1200 kg, South Korea & Taiwan 860 to 900 kg, Germany 540 kg, USA 410 kg, Malaysia 345 kg, Thailand 150 kg, China 160 kg and Vietnam 48kg. And India is at 30 kg only - which is just above the average level in most of Africa. This is also indicative of where India stands compared to neighbouring countries such as Malaysia, Thailand, China and even Vietnam. What do these figures convey about India? First, the current per capita steel consumption in India, at a dismal 30 kg, is only at the level of an under-developed country, let alone a developing one. It indicates that no meaningful infrastructural development has occurred in the country as a whole. Second, the current proportion of flat to long product consumption in India, at about 55% to 45% (ideally, the reverse is desired today), is alarmingly tilted towards the flat products for the present level of development and is a consumption pattern found in near developed countries. These two facts are significant and indicate that India has very small pockets of high development alongside major areas in the country in a state of neglect - small developed pockets where the demand for cars and white goods is high alongside major and large tracts that are under-developed. Clearly, large amount of work remains to be done in development of the country as a whole. The government is apparently seized of this anomaly and has over the past few years visibly begun to set right matters. The Joint Plant Committee has estimated steel consumption at a conservative 100 million tonnes (mT) in 2018. This may not be enough for India to keep its appointment of being considered as a developed nation in 2020s. While we may have by that time many more areas of high development as per world standards, the country as a whole would still have large areas that would remain neglected. 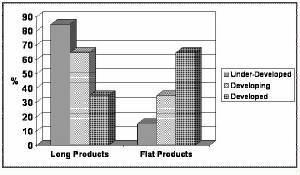 Correct its flat to long product ratio to around 45% flat and 55% long. A comparison between China and India will highlight this.